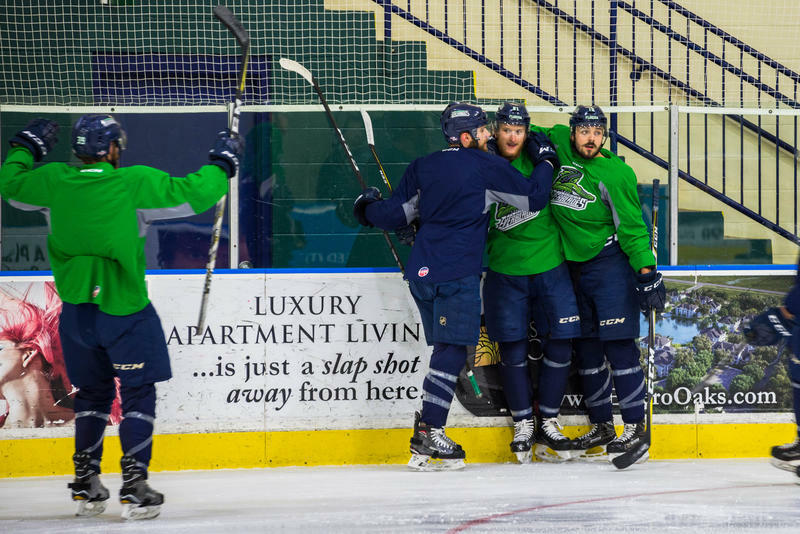 Forward Joe Cox skates toward his embracing teammates at the Everblades practice Friday before Game 7 of the 2018 Kelly Cup Finals. Now, after dropping Game 6 of the finals on the road, the team is back on home ice to face the current Kelly Cup champions for a final time tomorrow night. The series for the Kelly Cup plays out a lot like the games heading up to the NHL’s better-known Stanley Cup. It’s a race to win 4 games first – and now, the teams are tied, 3-3. Reed’s been with the team for quite a while, since before the first and last time they won the cup back in 2012. The team of completely new faces hasn’t made the finals since then, but making the playoffs is almost non-news for the organization. In its 20-year history, the team’s made the playoffs 19 times, and the Southwest Florida community has taken notice. Within 12 hours of the team’s loss in Colorado, Game 7 tickets – some 7,200 seats – sold out. So, Reed said, the team decided to open up a couple hundred standing room only spots, and those sold out too within two hours. Coach Brad Ralph says that’s because the area is a – perhaps unexpected – hockey haven. Ralph said, while the home-ice advantage could help, being one win away from the cup is going to make it difficult to not think about what it would feel like to actually win it. Everblades defenseman Zack Kamrass might argue it’s more than what you play for all season. It’s what you play for all your life. “This is what you dream of as a kid when you’re playing mini-sticks or street hockey, or even when you’re, you know, 6, 7 years old and you’re playing your first tournament,” he said.